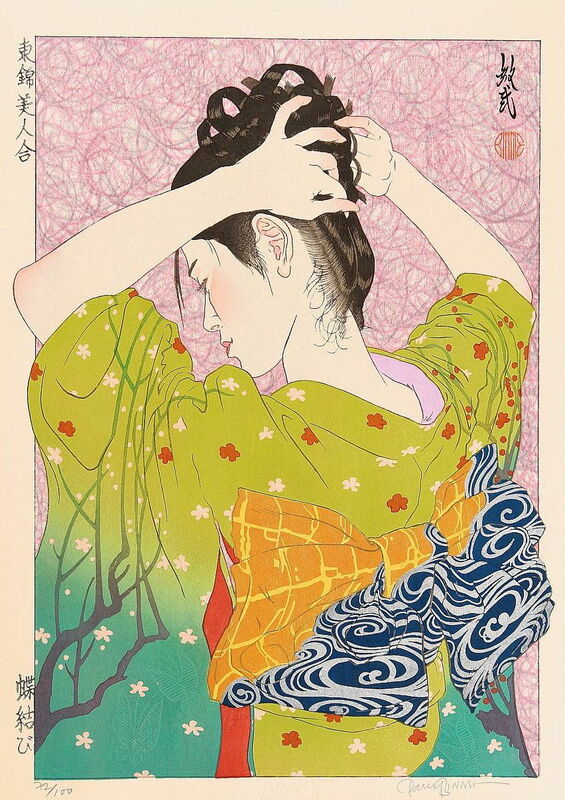 Paul Binnie's newest woodblock print is called Cho Musubi (Butterfly Bow), and is the first in a new series of prints of Japanese women to be called To Nishiki Bijin Awase A Collection of Eastern Brocade Beauties. Printed from 14 blocks, it employs 27 colours, which include gold mica, silver metallic pigment and embossing, and it is printed on finest quality paper from Iwano Ichibei XIII, a Living National Treasure in Japan. The model for this design is Binnie's favourite model, Akiko [who also modelled for Natsu and Engawa ], and she is fixing her hair, and seen slightly from behind, exposing the nape of the neck, which is considered a very beautiful part of the female body by the Japanese. She wears a kimono in two tones of green, the upper part a very yellowish green known as Uguisu, the Japanese nightingale or bush-warbler, a little bird emblematic of spring and whose feathers are this shade, and the lower part of the kimono is a turquoise green-blue, reminding one perhaps of cool waters. Two plum trees are on her sleeves, and one is red, while the other is pale pink, and pink blossoms scatter the kimono. Her obi or sash is tied in the Butterfly knot of the title, and is in two distinct colours, the upper part in gold mica in a gold-leaf pattern, and the lower area has silver water swirls on deep blue. Those familiar with Japanese art of the Edo period might recognise the reference in the costume to a famous pair of screens by Ogata Korin (1658-1716) known as Red and White Plums and currently held in the Museum of Art in Atami. On one level, this new print refers back to the Edo period, but it also has close ties to the Shin-hanga (New Print) movement of the inter-war years, and in particular to the artists Ito Shinsui, Torii Kotondo, Yamakawa Shuho and so on, whom Binnie admires and collects, and whose traditional views of women engaged in everyday activities are hugely popular with print enthusiasts. In many ways, Binnie is returning to the motifs and atmosphere of the twenties and thirties in his work, and this may be in response to his close study of the prints of this period. There are few woodblock print artists today willing or able to spend the time it takes to create prints in the traditional ways of the last few centuries, and Binnie is also deeply influenced by the style and aesthetic appeal of the past. What draws him to the Shin-hanga movement in particular is the connection between East and West at that period, when Western artistic ideas travelled to Japan and became part of the Japanese sensibility, and as a Western-trained artist, Binnie seems to feel a mirror image influence of Japanese traditional art on his work. Indeed, it may be that he has reached the same aesthetic conclusions as his illustrious forebears by opposite but parallel journeys. Paul Binnie's announcement, October 2005 .